Follow our complete, step-by-step, photo illustrated instructions on how to Spatchcock a turkey, then roast it in the oven. This 14lb turkey cooked in one hour and ten minutes. Really. Crispy skin, moist all the way through, and ready in no time. Printable recipe included. Yes Virginia, you really can cook a whole turkey in about an hour. I was one of those that found it hard to believe also, so don’t feel bad. I feel your pain. There’s no telling how many years I got up early on Thanksgiving morning to get a turkey in the oven. I’m sure you may have done so as well. It was almost like it was part of the tradition, something you had to do in order to have a turkey on the table by noon time. I roasted this almost 14 pound turkey in 1 hour and 10 minutes. I’ve got a recipe for How To Roast A Turkey elsewhere here on Taste of Southern. This recipe pretty much follows the same procedure except this one requires that you remove the backbone and flatten it out before roasting. 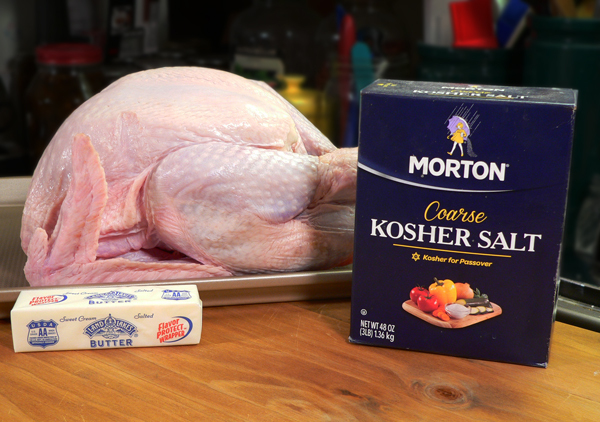 With both recipes, I dry brine the turkey, rubbing it with Kosher Salt and placing it uncovered in the refrigerator overnight, or at least for 12 hours. 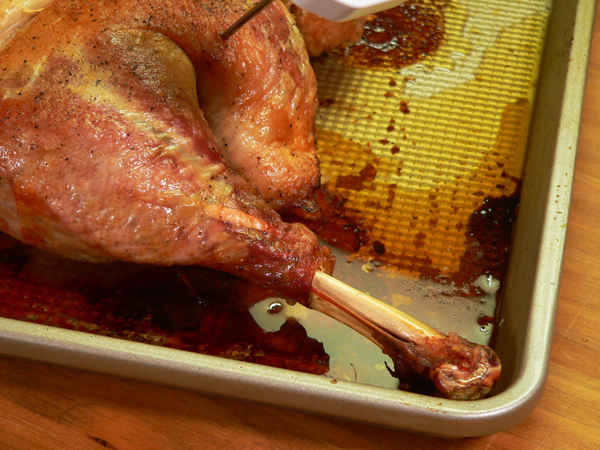 This dry brine helps to dry out the skin so that it cooks up nicely browned and crispy. The only difference between the two, is this one cooks much faster. Very much faster. I know it has a funny name. Some folks also refer to it as a butterflied turkey. Either way, it works. This process will work with a turkey of any size. Just be sure you have a very sharp knife or good poultry shears to cut out the backbone. That’s very important. And, make sure you know where your fingers are while you’re cutting. I was really pleased with how quickly this turkey cooked and with how moist it was. By flattening out the bird, it cooks more evenly so you’re not over cooking the breast while waiting for the dark meat to get done. It’s a win win all the way around. I know you’re going to like it. Ready to give it a try? Alright then, grab those poultry shears and head to the kitchen. Let’s Get Cooking! Butterflied Turkey, you’ll need these ingredients. These steps need to be done the day BEFORE you intend to roast your turkey. 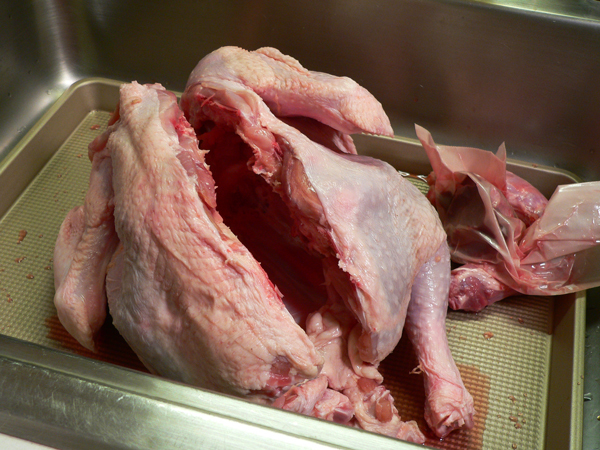 Remove your turkey from it’s packaging, place it in your sink, then remove the neckbone. If the giblets are included with your turkey, (some don’t include them) you will typically find the neckbone inside the cavity of the bird. Remove it and set it aside. 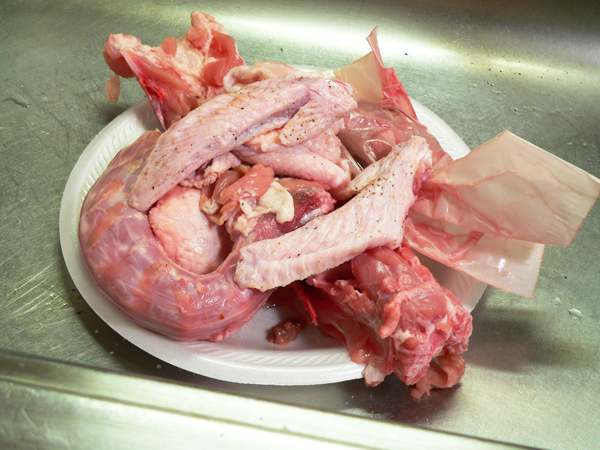 This is generally packed inside the neck cavity of the bird. The giblets are usually all together in a sealed bag. Remove the bag and set it aside. We will be using the giblets to make Giblet Gravy later. I always cut off the tail. You can leave it if you like, doesn’t really matter either way. Did you know this part is often referred to as the “Popes nose,” or the “preachers nose”? Don’t blame me, I didn’t make it up. It’s true though. Next, we will cut out the backbone of the turkey. I’ve placed the two black lines on the photo above to better illustrate where you need to make the cuts. This will be the most difficult part of the process. You need a really sharp boning knife or a really good pair of poultry shears to do this. You have a bone or two that you need to cut through, so use a lot of caution when you do this. Your fingers will thank you later. Smile. I started at the tail end and cut up one side of the backbone. I’m using kitchen shears, which I really didn’t know if they were good enough to do this with or not, but happily they performed great. Just always know where your fingers are before you make that cut. There were a couple of times where I had to use both hands to complete a cut. A few snips, grunts and two handed cuts later, I had made it through the one side of the backbone. Turn the turkey around, and head back the other way on the other side of the backbone. For this second cut, I’ll be starting from the neck and cutting back towards the tail. I’ve mentioned this before, but I am right handed. Most all of my photos show me using my left hand, but that’s because I’m using the right hand to snap the photos with. Again, do make sure you know where your fingers are at all times before you make a cut. With both cuts complete, the backbone has been removed. Set this aside with the giblets for now. We can use this later to make stock or maybe we’ll just cook it with the giblets to add more flavor. Congratulations, the hard part is complete. You done good. Smile. 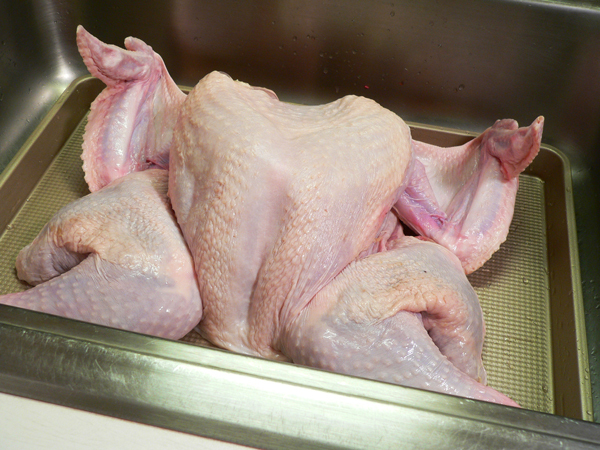 Rinse the turkey under cold running water, on both the outside and the inside. Now’s a good time to do any final trimming that might be needed. This is the skin from the neck that I will remove. I placed the knife so you could see where I’ll be cutting it. Right along where the cutting edge of the knife is. Trim away any other excess skin or pieces that you see. You can save that for the stock pot, or just discard it. Your choice. 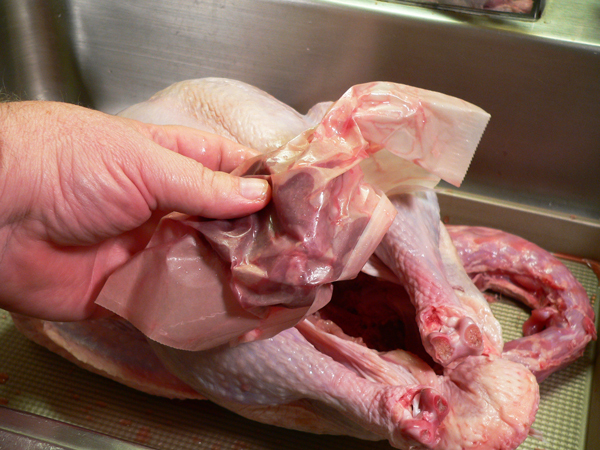 Pat the inside and outside of the bird dry with paper towels. This part will take two hands, but again, I’m taking photos. Just press down on the breast bone in the area where you see my hand here, and push hard. You’ll hear the bones crack when you do. This will flatten the bird for more even cooking. The turkey is now ready for the dry brine process. Flip the bird over, and sprinkle some kosher salt and black pepper over the meat. Just a light coat of salt is all that’s needed. Sprinkle the skin side with salt and black pepper. It doesn’t take a lot, but be sure to get it on all the surface areas and down in between the breast and the thigh area. I placed a small amount of kosher salt in a separate small container to make this job easier. Since I’ve been touching the turkey, then dipping into the salt, I’ll throw away the remaining salt once I’m finished. You don’t want to cross contaminate anything as you do this. I went ahead and placed some slices of butter under the skin of the turkey. I gently worked my fingers underneath the skin to loosen it from the breast meat. Then, I just placed some slices of butter underneath. You could also use some type of herb butter, or add any additional herbs and spices you might like to add more flavor to the cooked bird. That’s it, you’re done for now. That wasn’t too hard was it? Place the turkey UNCOVERED on the bottom shelf of your refrigerator for at least 12 hours. Overnight is preferred. This will allow the salt to dry out the skin on the turkey which in turn will make for a much crispier skin once the turkey has been roasted. I suggest that you not have any other uncovered foods in the refrigerator at this time. They should be wrapped if you do. You also want this on the bottom rack so there isn’t any chance of juices spilling down onto anything else. Save those giblets and other pieces. I placed all this in a plastic zip lock bag and put it in the refrigerator as well. I want to use the giblets to make gravy and will probably just freeze the other pieces to use to make stock with later. You can find my recipe here for Giblet Gravy. Remove the turkey from the refrigerator two hours before you plan to roast it. Here’s my turkey after being in the refrigerator uncovered for 14 hours. The dark meat is really showing through the skin at this point, and you can easily see the butter pieces that I placed under the skin. I’ve elevated the bird on my OXO Silicone Racks, but it’s not really necessary. The turkey needs to just sit out on your counter, still uncovered, for about an hour and a half unless it’s in the middle of summer where you live at the moment. We’re going to let the turkey begin to come up to room temperature to aid in the cooking process. Just figure out what time you want to serve the turkey, allowing about 30 minutes after it’s cooked for it to sit once again and rest. Once it’s cooked, it needs to rest a bit so the juices can redistribute themselves throughout the bird. Brush the skin side with some melted butter before placing it in the oven. I slightly melted about three Tablespoons of butter in the microwave, then brushed it all over the skin side of the turkey. NOTE: If you think you applied a lot of salt to the skin, you can brush most of that away with a paper towel before you brush it down with butter. You don’t want the skin to be overly salty and ruin the taste of your turkey once it’s sliced. FOLLOW THESE BAKING INSTRUCTIONS CAREFULLY. Place the turkey in a oven preheated to 425F degrees. Roast the turkey for 30 MINUTES at 425F degrees. REDUCE the temperature to 325F degrees, cook turkey until done. 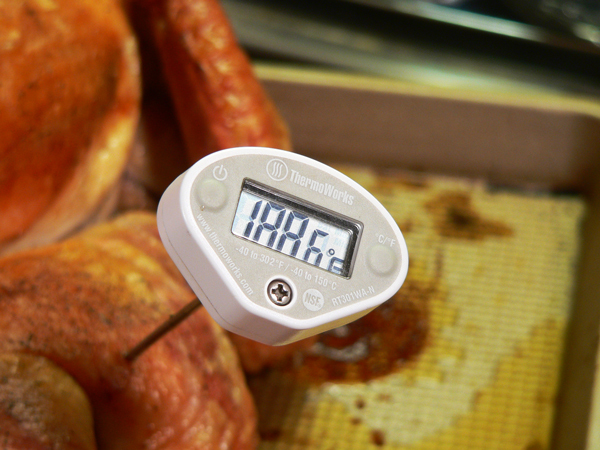 You’ll find many variations regarding the temperature that turkey needs to be cooked before it’s done. Some say the temperature in the thigh needs to reach 185F degrees, and the breast meat needs to be cooked until it reaches 165F degrees. I’ll go along with those temperatures. One of the problems when trying to roast a whole turkey is that the darker meat takes longer to cook than the white meat. Thus, the white meat will overcook and begin to dry out while you wait for the thigh meat to come up to temp. With this spatchcock method, the turkey lies flat on the pan, and it cooks more evenly. The thighs cook quicker this way so the breast meat doesn’t have time to dry out. I suggest you always use a digital thermometer to check the temperature with. You can find them for 10.00 or less at lots of big box type stores. Insert the thermometer into the thickest part of the thigh, being sure not to touch the bone, and check the temperature at that point. 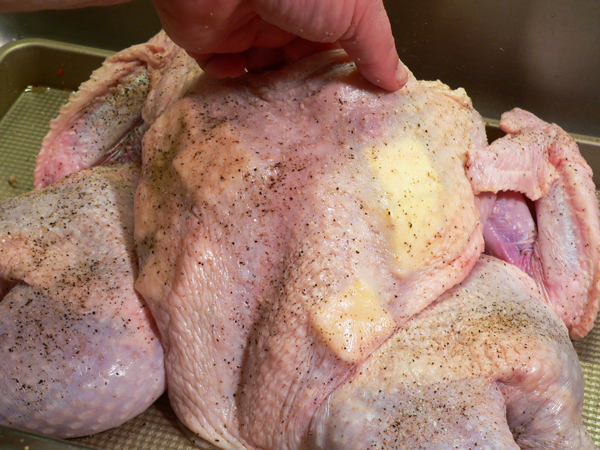 Check several points around the thighs and breast to be sure it’s done all the way through. Once it’s done, remove the turkey from the oven and place the pan on a wire rack to cool. 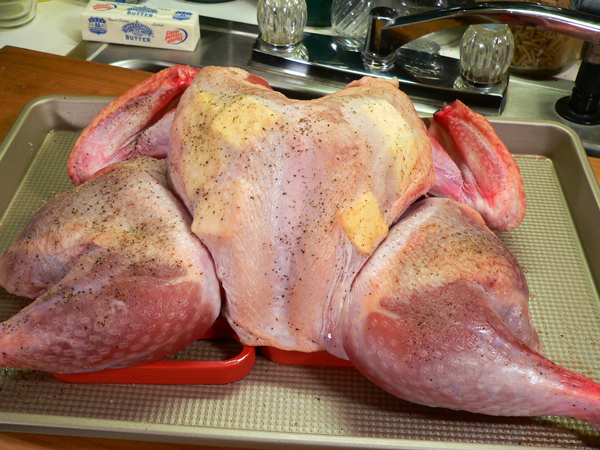 Lightly cover the turkey with a sheet of aluminum foil and let it rest for at least 30 minutes prior to slicing. Don’t forget to save the pan drippings. We will use them to make our Giblet Gravy. It really did cook to perfection in an hour and ten minutes. Gotta love that… right? Yield: Varies according to size. Follow our complete, step-by-step, photo illustrated instructions on how to spatchcock a turkey, then roast it in the oven. This 14lb turkey cooked in one hour and ten minutes. Really. Crispy skin, moist all the way through, and ready in no time. Turkey must be fully thawed. Place turkey in sink, remove from packaging. Remove the neck from the turkey cavity if included. Remove the packet of giblets from the neck cavity if included. 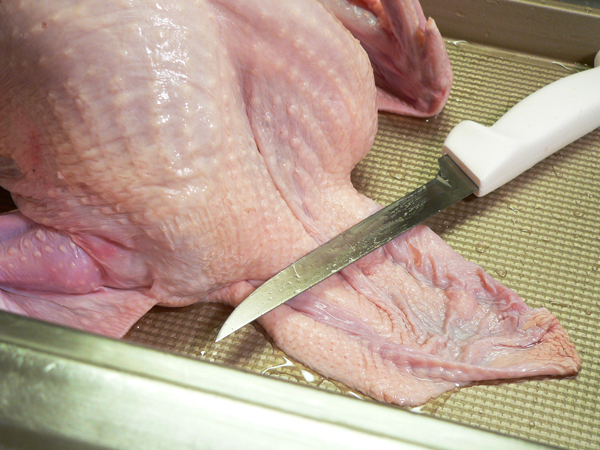 Cut and remove the tail of the bird if desired. 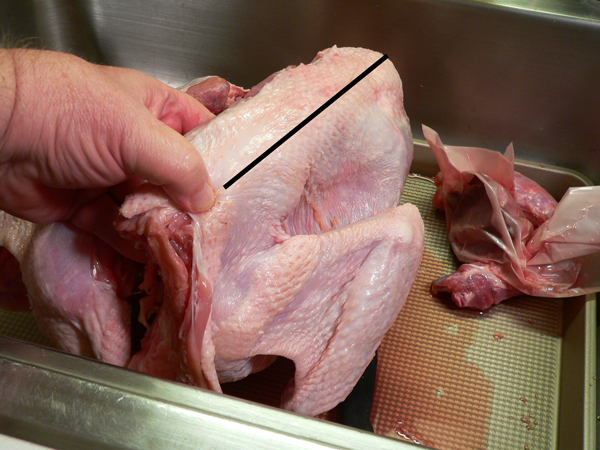 Using a sharp knife or poultry shears, cut along both sides of the backbone to remove it. Rinse the turkey all over under cold running water. Trim away any excess neck skin or other excess pieces of skin as needed. Using both hands, press down on the breast bone to crack and flatten it. Using paper towels, pat the bird dry on both sides. 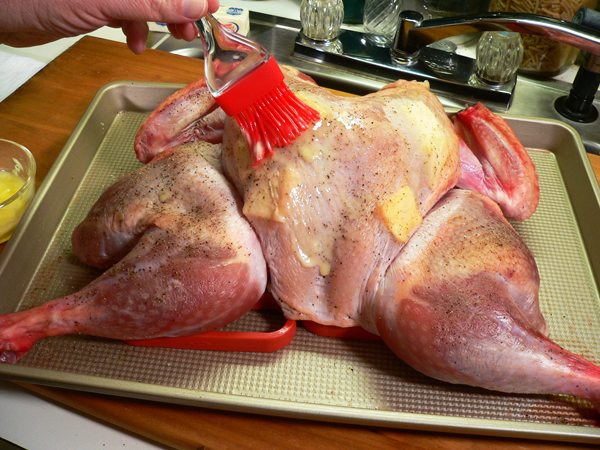 Sprinkle both sides with Kosher salt and black pepper to serve as a dry brine. Gently slip your fingers beneath the skin to lift it from the meat. Insert several slices of butter or herbed butter underneath the skin. Place uncovered in the refrigerator for 12 to 24 hours. 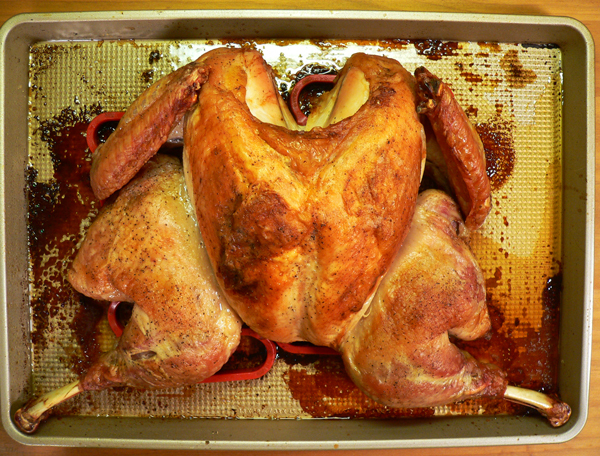 Remove from the refrigerator about two hours before you plan to roast the bird. Let the turkey come up close to room temperature while you preheat the oven to 425F degrees. Brush the skin side of the turkey with slightly melted butter. Roast for ONLY 30 MINUTES at 425F degrees. REDUCE the temperature to 325F degrees and cook the turkey until done. 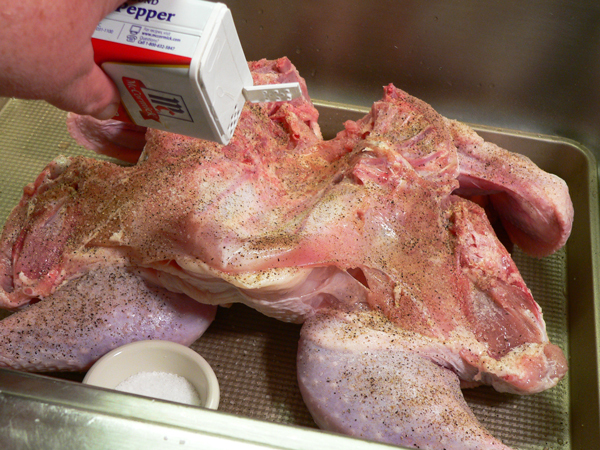 Insert a digital thermometer into the thickest part of the thigh and breast to check for doneness. Thigh meat needs to be cooked to 185F degrees and breast meat should be cooked to 165F degrees. 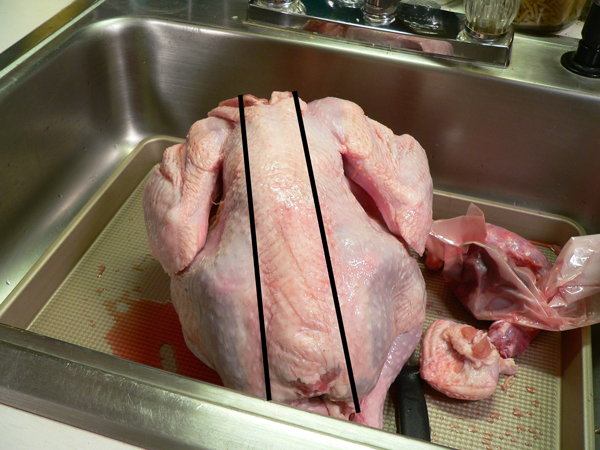 Remove the turkey from oven when done, place pan on wire rack. Lightly tent turkey with foil. Let the turkey rest for at least 30 minutes before slicing. Your Comments: Have you ever tried this spatchcock method to cook a turkey? What did you think about it? Think you might try our recipe some time? O my, Steve this is the only way we will cook a turkey from now on. Did a 12 lb. exactly as instructed, absolutely delicious and so easy to carve. Had a crockpot ready for the wreck and trimmings. Made that healthy broth for soup and pie. Thanks for showing an old dog a new trick. You be Blessed! I’ve smoked three spatchcock chickens in the past two months and my wife and I loved them. I’m looking forward to our first roasted spatchcock turkey for thanksgiving and will be following your recipe. I do have a question. What did you use to line the pan? Will a cookie cooling rack work? Any suggestions would be appreciated. I’m 72 years old and my wife had a stroke in 2011. Now that I do all the cooking for both of us, I sure wish I would have paid closer attention to all magic she did in the kitchen. Thanks for the reply. I followed your directions closely and was amazed how easy it was. I just finished prepping the turkey and is now in the refrigerator. I will send you a photo of the finished product. I can’t figure out how to include a picture, but the turkey came out looking good and tasting great. My sister-in-law joined us for Thanksgiving, and she commented on how juicy and flavorful this turkey tasted. Thanks so much for your recipie and suggestions. I will definitely do this again. We hope you had a great Thanksgiving. Be blessed yourself, and thanks again. Hey Steve, can’t wait to try this, NEVER heard of it !!! Merry Christmas ! I’ve spatchcocked a chicken before, but never thought about doing a turkey. 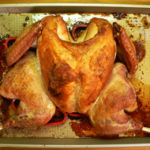 It definitely looks like you get more crispy skin than you usually do (unless you flip your turkey part-way through). Thanks for a way to save a bit more time, especially since I do make the dressing on the side. I have spatchcocked our turkey for several years, now. I saw a demonstration on TV several years ago and decided to try it. That’s the only way I’ll cook a turkey from now on. I’ve also fixed whole chicken this way. In order to do this, I did have to go buy poultry shears. Sometimes I need to get my husband to help when my arthritis is acting up. I enjoyed reading your newsletter and your recipes. Best wishes to you in the coming year. Steve, you are so funny!! This is certainly an interesting way to cook a turkey and I’m going to try it sometime. Thanks for sharing it with us!